I admired him. 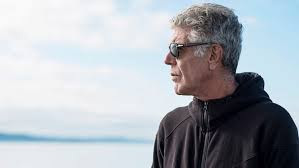 His show, Parts Unknown on CNN was the best thing on television. Someone, I think it Eric Ripert, said he was the greatest storyteller. He was that and so much more. I believe that each of us should have the liberty to live and die. I respect his choice today. But I am heartbroken. I feel like the world lost someone important, special and irreplaceable. The world is awful, but you, Mr. Bourdain, brought a different view that made me feel somewhat like hope.